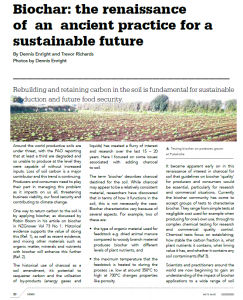 I think the following should be of interest in NZ based on the levels of Cd contamination in some of our soils. There are other similar research finding coming from China. 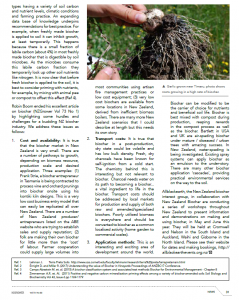 I posted a link to a NZ PhD thesis on the contamination issue in April at the ABE FB page that fails to mention biochar as a potential solution. Chemical activation and microwave assisted activation were adopted to modify biochar. 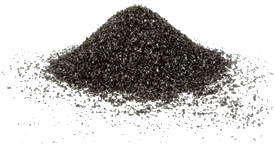 Activated biochars were characterized by SEM, BET, FTIR, XRD and XPS. 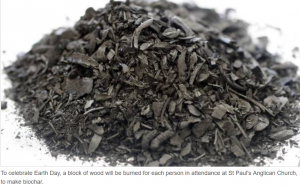 Raw biochar, activated biochars and commercial activated carbon were compared as remediation strategies for sediment from the Xiangjiang River containing 14.70 mg/kg Cd. After the treatment by activated biochar, the overlying water and pore water concentration of Cd decreased by 71% and 49%, respectively. And the threat of heavy metal along with bioavailability of Cd was depressed. Moreover, the immobilsation of Cd in sediment was related to BET surface area and the content of oxygen containing functional groups of activated biochars. Furthermore, a PCR-DGGE-based experiment was performed for the detection of microbial community. The indigenous microbial community was affected and new microbial community appeared after treat by activated biochar. 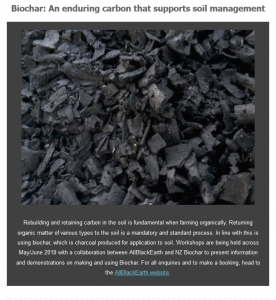 Activated biochar can be used as an inexpensive and efficient in situ remediation material of sediment containing metal. Dennis and I are very grateful for their support during our stay for the Nelson workshop and the preceding public forum in Motueka that CAA organised. 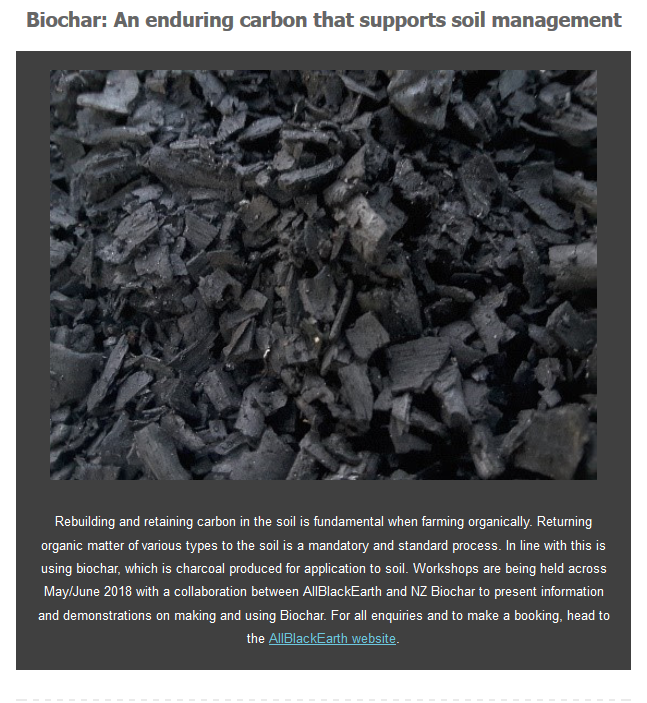 More on this and the other workshops soon. 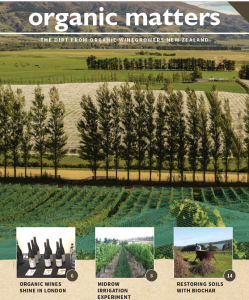 Zespri have been kindly supporting our efforts to educate and inform the kiwifruit industry on opportunities related to biochar production and application. 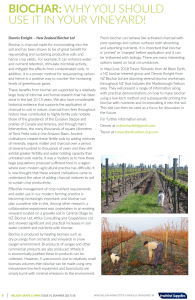 They have published a short article in their latest industry magazine (linked from their banner, above). 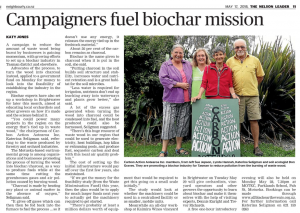 Zespri have recently provided some support to research related to biochar through a Waikato University internship but they are not endorsing the use of biochar products. 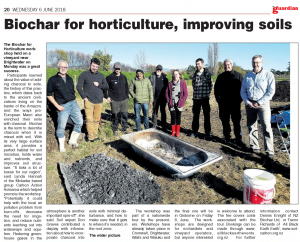 The nascent biochar industry needs to work with agriculture industries in NZ to validate claims and ensure safe application of new products. Hopefully, the research community will also become more active and interested but this may only come from more funding. 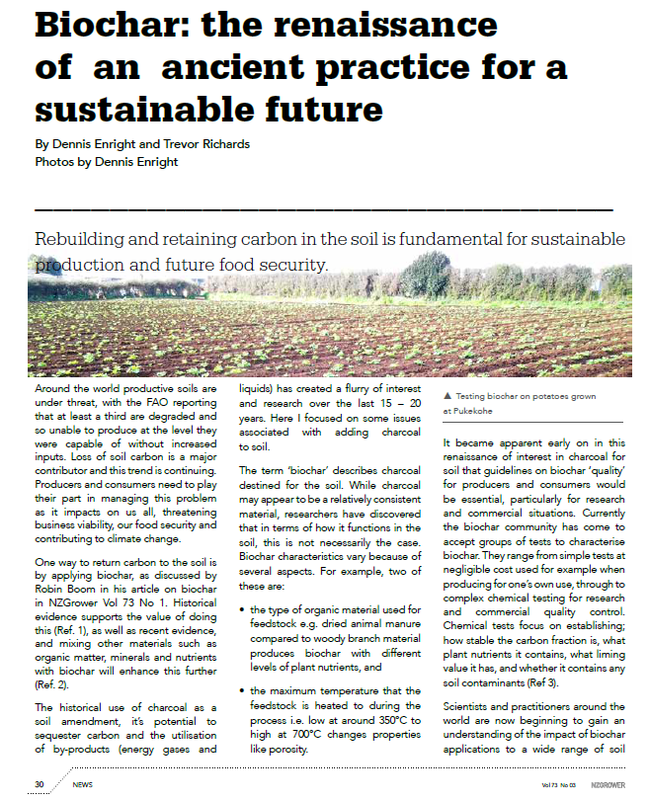 You can access a copy of the article from the page links below. You can access the article pages from the magazine by clicking on the adjacent cover image or the article title, above. Note that the link provided in their newsletter was faulty (corrected, above).